Above are the covers of three booklets in the Irish Life & Culture series published by Colm Ó Lochlainn’s Sign of the Three Candles. Norah McGuinness illustrated the first example while the other two are uncredited. Ó Lochlainn (1892–1972) was a printer, publisher, typographer, uilleann piper, Gaelic scholar, ballad collector, choir director and Professor of Language and Literature in UCD. Along with giving the designer Karl Uhlemann his first job at the Three Candles press, he also employed Seamus Ennis there for many years and introduced him to Professor Seamus Ó Duilearge of the Irish Folklore Commission. Ó Lochlainn’s son Ruan inherited his father’s interest in design and music. He designed the cover of Ronnie Lane’s Slim Chance while also playing keyboards and saxophone on the album. I love the typography on these covers. While the designs appear effortless there is real craft at work here. 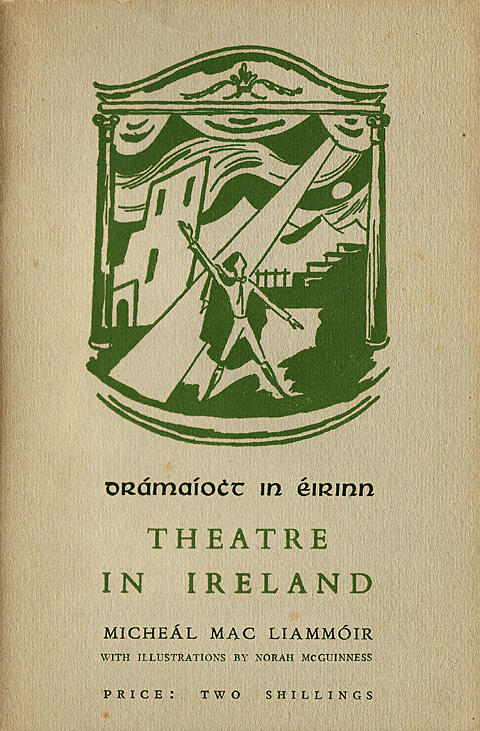 The back cover which I’ve included shows the logo of the Cultural Relations Committee of Ireland which no doubt financed the publication of the series.